I've been thinking for a while to upgrade my trustworthy Optiplex FX160 home server for something with more upgrade options. My main concern is that my actual server is running out of space, and I have no option to add more drives (I could use USB drives, but they will be out of the housing and I'll be limited to USB 2.0). I've made really good experiences with business-class Dell systems, and though about getting a SFF (small form factor) desktop-type system. I know that you can get some nice systems on Ebay, with CPU's ranging from Core 2 Duo's, Core 2 Quad's and second-generation Core-i's. - Chuck ~10€ more and you get a Windows 7 License (upgradable to W10). I like the idea of the integrated e-Sata and the free PCI/PCIe ports to add a USB 3.0 controller card. The CPU has a passmark of ~2100, which should be more than enough for basic NAS usage (my current setup has a Atom 330, and it has me covered for all my needs). - DDR2 memory: for my needs, I do not need fast ram. I don't even need a lot of it (2 Gb are usually enough). However, it is more expensive and difficult to get. - Proprietary motherboard: Dell still uses BTX form factor, which basically is incompatible with everything. - Unusual CPU position: I made the experience already with a HP DC7900 usdt with a LGA775 socket. There is an array of capacitors around the CPU which make using an aftermarket cooler almost impossible. - Power consumption: my current rig idles a 5-8 W. The C2D E8400 idles at 15-18 W at least. Not my bigger concern, but I just got used to the low consumption of the FX160. 1. 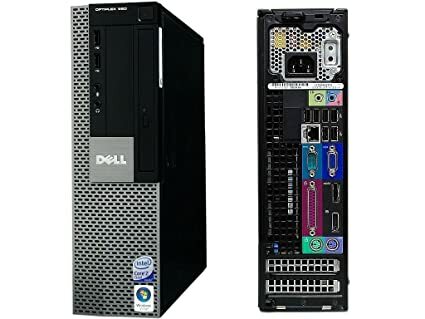 Has somebody experience with one of these PC's as home server? 2. Any thoughts about the age of the components? 3. I find the 100€ price tag quite attractive, given what is inside. What do you think? For around 100€ more I can get a system with DDR3 memory and a Core i3 (Optiplex 790), but with only 2 Sata ports and without eSata. But for the end price, I can better build a new system. Therefore, I don't think that going for a ~200€ system is such a good deal, given that I have to invest in several other components to achieve the same functionality that I get from the 960. - It has an integrated Raid Controller which allows Raid 0 and 1 modes. The system can, theoretically, accommodate up to 3 2.5'' drives: 2 on the integrated HDD caddy, and one thru a Slimline HDD caddy (which I happened to have one laying around). - Sata 2 connectors (3 internal + 1 eSata). - The CPU can be upgraded up to a Intel Core 2 Quad Q9650, which has a respectable 4277 Passmark. After some negotiation with the seller, I got one for 99.50€ with shipping, 2 years of warranty and 1 month no cost return. Not bad! The post was edited 1 time, last by Eryan ( Mar 8th 2016, 9:21am ). So, after some number crunching, I came to the conclusion that upgrading my current setup with a bigger HDD would be less cost-effective than replacing the whole rig. As much as I hate to replace my little FX160, fact is that it can accommodate only 1 data drive. I ended up ordering the Optiplex 960 sff and got it for 99€ with shipping. The computer is a tad bigger than the FX160, but it follows the same design. The build quality of the case if impressive and the one I got had no scratches. It was, overall, in really good shape. Pulling a lever on the top of the housing releases the side panel. The first thing you notice is that the case makes really good use of the available sapce. On top you have the PSU (235 W), next to it the slim line Sata DVD drive (which will be replaced with a HDD Caddy). Below it are the CPU cooler with 2 fans in a push-pull configuration (80 x 25 mm pushing, 60x25 mm pulling), and right next to it the HDD cage which can hold up to x2 2.5'' HDD or a single 3.5'' drive. Removing both the cooler and the HDD cage grants access to the motherboard. Dell used a BTX motherboard, and it can be seen in the odd layout of the components: the CPU is below to the left and angled 45°. The cooler, however, is big and provides enough surface area for cooling. To the right, a PCIe 1x16 and a PCI slot are available for upgrades. The plan is to use those ports to add USB 3.0 and/or more Sata ports (there are only 3 in the motherboard + an eSata port behind). However, the oddest of all the components is the small PCIe x1, which sits just below the CPU cooler! It is supposed to accommodate a Wlan card with some sort of proprietary form factor. However, it seems that there is no Bios white-list, meaning that it might be used for something else. I replaced the DVD drive with a HDD Caddy and inside of it a SSD with OMV (from my previous rig), replaced the 3.5'' HDD that came with the computer with the 2.5'' HDD cage with my data drive, cleaned the fans and proceeded to test my new home server. As expected, migrating OMV to the new rig was a breeze and there was no problem at all. Everything worked out of the box! - I was concerned about the noise, since the computer uses 3 fans (2 for the CPU/HDDs and 1 inside the PSU). However, I was amazed how silent it is! You can certainly notice a really low buzzing, but that is only if you are standing next to the computer. - It uses an UEFI Bios with quite an array of options. - The thermal management is really good, despite of the odd positioning of the fans. The 80 mm one blows cool air to the CPU, while the 60 mm pushes and also blows air to the HDDs. You could say that the 60 mm one blows hot air from the CPU to the HDDs. Still, the temperature of the CPU remained around 32° C when idling and the HDDs around 30° C with the fans spinning at really low RPM. - The performance is far better than my old build. I find the network transfers to be faster, and certain plug-ins like Owncloud or Couch Potato are much more responsive and fast. The system has only 2 Gb of ram (the same as the old build) but it seems that the faster processor and Intel NIC make a difference. - I left the system running with an electricity usage monitor to check the power usage. The Core 2 Duo E8400 has a TDP of 65 W. The Atom 330 in my other rig had only 8 W TDP, therefore I am expecting the power consumption to be higher. I'll give it a couple of days and based on how high is the consumption I might disable some components/ports thru the Bios, and send the system to sleep a few hours a day when not in use. And what about the FX160? I wont get rid of the that one. I was thinking to repurpose it as a Linux computer or as a retro gaming rig. The CPU is powerful enough, and the GPU might suffice for some N64 / SNES gamming. The post was edited 3 times, last by Eryan ( Mar 30th 2016, 10:02pm ). Fixed. For some reason, the link to my Google Drive stopped working. Thanks, for some reason we all love pics. Just curious to see what other people are up to. That looks like its going to make a nice NAS! In many systems, disabling in BIOS frees up system resources but doesn't stop the device from drawing power. So you may find you don't save much power doing that. The E8400 was just about the most efficient of the 65W desktop Core 2s. They typically idle at less than 4w, and even at 100% load they draw about 35w. The Q45/ICH10 chipset isn't as energy efficient as the CPU though, especially when multiple disks are attached. I think TDP on that is around 21W, with idle ~7-8w. So, when your system is idling or at low CPU load, the chipset will actually be drawing as much or more energy than the CPU. It is, indeed, a really nice NAS! I found that the system iddles at 33 W. It is not really high, but extrapolated to one year it becomes 75€ per year in electricity. I thought that the speed step was disabled in the bios, but it wasn't. The cpu underclocks to 2 GHz when iddling. I disabled any othwr stuff that I don't need in the bios (parallel and serial ports, pci, etc) but it dis not made a huge difference. Therefore, the suggestion from @Markess does make sense. The chipset is drawing the most of the power. So, what I did was to send the PC to sleep when not in use. It remains suspended during the majority of the day. I use it only at night when I get back from work. Doing so, the electricity costs decrease to 30-35€ a year, which is what my previous rig consumed. It seems like there is an issue with the caching from the pictures, but from the Google-side, because all my other threads with pictures are working properly. If it breaks again, I'll move the pictures to another storage service. I just received my Dell optiplex 960 SFF yesterday. It's a refurbished model with the same specifications as the one you have (i think), with a Core 2 Duo (3.0 GHz), 2GB DDR2 RAM. I'd just like to ask for your recommendation for upgrades - RAM, SSD and Graphic Card. From my own reading and research, it seems that the only graphic cards compatible are single slot and low profile ones. Did you upgrade yours as well? (I'm sorry if I missed it, coz somehow some of the images couldn't be viewed over my side). Thanks so much! You don't need a graphics card if you plan to use it just as a server. Hook it up via VGA to a monitor and install OMV on it. After it is done you can remove the VGA cable and connect via LAN to the server. If you plan to use the Dell as mediaplayer as well (Kodi, Emby or Plex) than you need a graphics card. If you plan to use the Dell just as a simple server with file sharing than 2GB is ok, but if you plan to install Emby Server or Plex Server I would suggest to upgrade to 4GB. Using a cheap small SSD for the OS and a hdd for files is a good idea. I had a SSHD (Seagate 1TB - see my sig) lying around so I used it for OS and files (with two different partitions). You can also use a cheap hdd as OS-drive but an ssd is much faster. @Huberer pretty much explained pretty good. As server, no graphic card is needed. You even can set the RAM used for the integrated graphics to a minimum (32 MB I think). In my case i just boosted the RAM to 4 gigs, an SSD as system drive and that was it. I no longer use the 960 as my main server. The power consumption was way too high, so I am in the process of repurposing it. IMMO, using it as a media player is kind of an overkill. You could perhaps go cheaper with a Raspi or a Fire TV if your goal is a media player.